(Nanowerk News) At invitation of the Innovation Society, St.Gallen, on March 18th, the national FramingNano Conference took place in the Stade de Suisse in Bern. Numerous stakeholders from industries, authorities and associations discussed the proposal for a European Governance Platform for a responsible development of nanosciences and nanotechnologies. The FramingNano Governance Platform is the main outcome of the corresponding 2-years project funded under the 7th Framework Programme of the EU. Through stakeholder consultation, FramingNano aimed to substantiate principles and procedures which are regarded essential to establish and maintain a responsible and sustainable development of nanotechnologies. To align the Platform to the interests of the different stakeholder groups, a series of multi-step consultations and workshops has been organised in European Countries including Switzerland. The workshops served to advance the concept of the Governance Platform and to gather expert inputs on possible ways of implementation into the decision making processes of nanotechnology governance at the European level and beyond. The FramingNano Governance Platform offers an inclusive, continuous and adaptable framework to identify and assess challenges in the governance of nanotechnologies and to support the corresponding decision makers in their decision making procedures. The concept of Nanotechnology-Induced Changes (NIC) is used to guide the proposed model of nanotechnology governance rather than a one-sided focus on risks only. The Platform is geared around three key elements which provide means of how to create a common understanding of the challenges induced by nanotechnologies: a procedure dedicated to establish ‘common assessment methodologies’, an ‘observatory’, and an ‘advisory’. 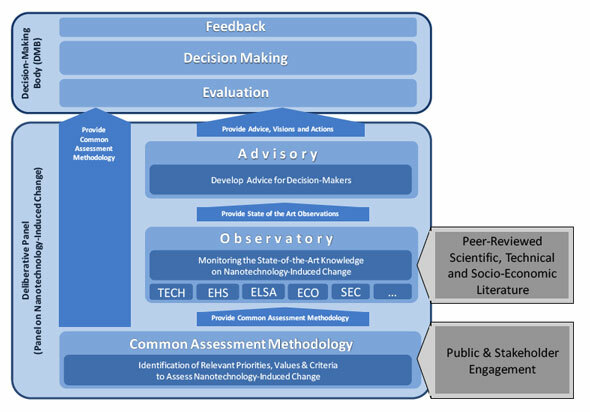 Based on the input of the common assessment methodology and the outcomes of the observatory, an ‘advisory’ board will translate this intelligence into visions, actions and recommendations on nanotechnology governance for decision makers. The FramingNano Governance Platform was well received by the participating Swiss nanotechnology stakeholders and overall accepted as a sensible way forward to address current and future issues of nanotechnology governance. The continuous and adaptive model of governance was particularly acknowledged. It was however also pointed to the fact that the implementation of the Platform will probably be complicated, in need of political will, and possibly a lengthy process yet to come. The participants further discussed aspects of an implementation of the Governance Platform in Switzerland. It was however acknowledged that such an approach would only fully unfold if installed on an international level. The FP7 project “FramingNano: An International multi-stakeholder dialogue platform to regulate the development of Nanosciences and Nanotechnologies (NS&T)” started in May 2007. The two years support action (SA) is funded under the Programme Capacities, in the area Science in Society, within the 7th Framework Program (FP7) of the EU. Itincludes six partners from six European countries. FramingNano is led by AIRI/Nanotec IT (Italy) and includes The Innovation Society (Switzerland), The Institute of Nanotechnology - IoN (UK), National Institute for Public Health & the Environment - RIVM (The Netherlands), Fondation EurActiv (Belgium), Technology Centre (Czech Republic). For further information please contact the national workshop coordinator Markus Widmer ([email protected]).